When we started using Google BigQuery – almost five years ago now – it didn’t have any partitioning functionality built into it. Heck, queries cost $20 p/TB back then too for goodness’ sake! To compensate for this lack of functionality and to save costs, we had to manually shard our tables using the well known _YYYYMMDD suffix pattern just like everyone else. This works fine, but it’s quite cumbersome, has some hard limits, and your SQL can quickly becomes unruly. Then about a year ago, the BigQuery team released ingestion time partitioning. This allowed users to partition tables based on the load/arrival time of the data, or by explicitly stating the partition to load the data into (using the $ syntax). By using the _PARTITIONTIME pseudo-column, users were more easily able to craft their SQL, and save costs by only addressing the necessary partition(s). 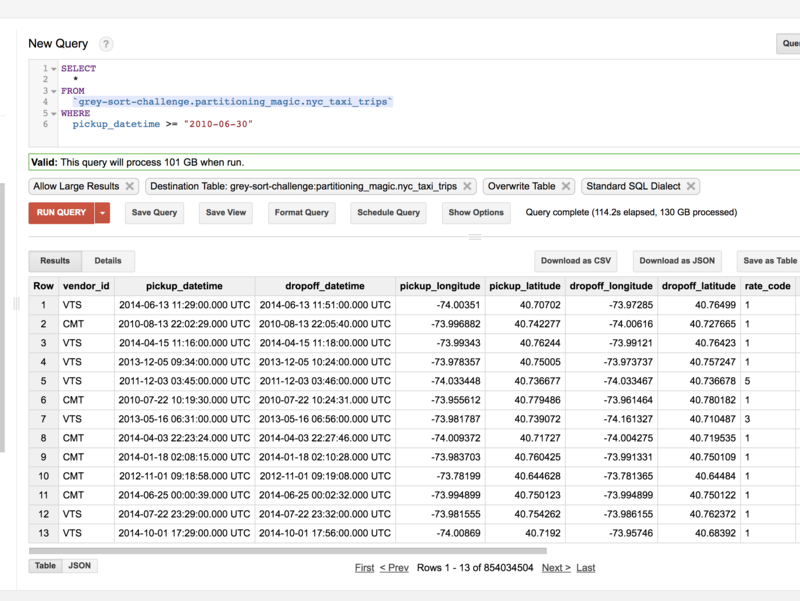 It was a major milestone for the BigQuery engineering team, and we were quick to adopt it into our data pipelines. We rejoiced and gave each other a lot of high-fives. However, as welcoming as this new feature was at the time, it still came with a few obstacles. Firstly, there was no easy way to convert an exisiting non-sharded suffix’y table (yup, sadly we do have a few of them in our projects) to a ingestion based partitioned table. See this awesome Stack Overflow thread for more details on that! Secondly, because it was based on ingestion/load time, we still needed to do some work when wrangling our datasets to figure out the correct partition to load the data into. And when you’re working across multiple timezones this can be extremely challenging. To help us manage this, we became heavily dependant on Cloud Dataflow and it soon became a vital component in our data workloads. A few months ago, the BigQuery team released this. Can’t be arsed reading it? No worries, I’ve already done it for you. What this means is that you can now partition a table by using a column in its schema, and not just by the ingestion time. So, no more queries using _PARTITIONTIME and having to work out the correct partition to load into. What a time to be alive folks! Note: this feature is still in beta. If that’s OK with you, then read on. We now have a nice partitioned table. Hooray! 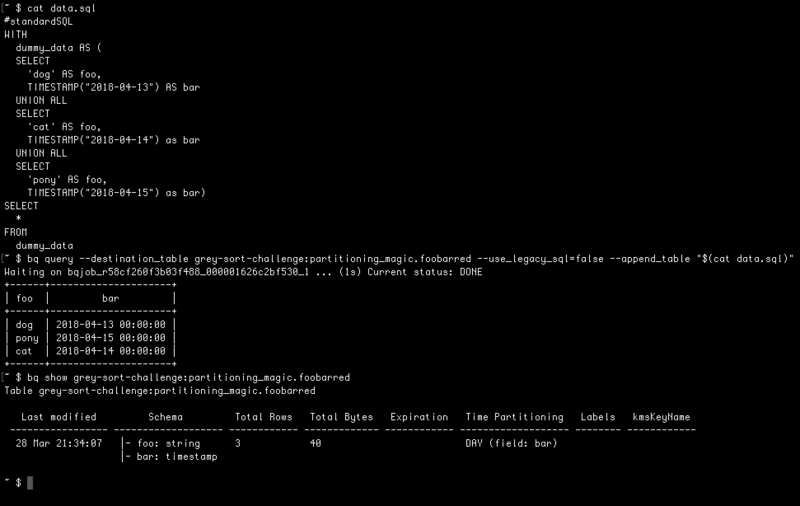 bq query --destination_table grey-sort-challenge:partitioning_magic.foobarred --use_legacy_sql=false --append_table "$(cat data.sql)"
bq query --use_legacy_sql=false "select * from \`grey-sort-challenge.partitioning_magic.foobarred\` where bar >= '2018-04-14'"
That’s cool and all, but what if you have a standard table (not one that’s manually sharded using the _YYYYMMDD suffix) and you want to convert it into a partitioned table? This is where it gets interesting folks. Whizz back up the list of ways to create a partitioned table I mentioned above. See #4 (“From query results“). This means we can now query an existing table and write it back to a newly partitioned table. It will cost you one full table scan. Using the public dataset of NYC taxi trips here’s a walkthrough of how you do it. bq query --destination_table grey-sort-challenge:partitioning_magic.nyc_taxi_trips_partitioned --time_partitioning_field pickup_datetime --use_legacy_sql=false "select * from \`grey-sort-challenge.partitioning_magic.nyc_taxi_trips\`"
And there you have….oh wait..
Why did it fail? Isn’t the number of allowed partitions 2500 according to the docs? And if it’s 2500, why is the error message spitting out the number 2000!? It turns out that in addition to BigQuery’s 2500 max number of partitions in a table, there is even a stricter limit on the number of partitions you can create in a single operation. 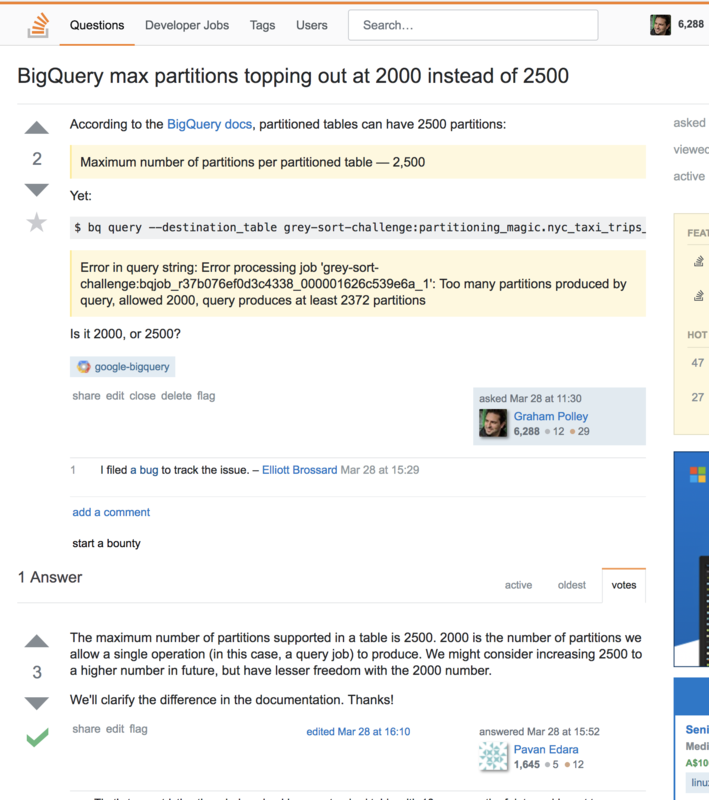 Remember, I tried creating a partitioned table in one shot using a query, so I hit the 2000 limit. I’m happy this happened during this post because it highlights something that you need to be very wary of when working with BigQuery. It does have quite a number of limits and quotas. I understand why they are imposed (i.e. it’s a multi-tenant system), but there are now so many it’s quite easy to forget about them, and you can suddenly find yourself walking face first into them. In my opinion, some of them are just too restrictive, such as this one. Using my dodgy math, I had calculated the table should now have about 5 years worth of data. As such, I hoped I would not hit the 2000 max partitions created in a single operation limit the second time around. I ran the same command as previously, and held my breath.. Column based partitioning is certainly a welcome addition to BigQuery’s toolkit. It took a while to get there, but it’s great to have it as another option instead of just ingestion based partitioned tables. That said however, it still has a way to go yet in terms of functionality e.g. partitioning by non date/time fields, partition by multiple columns, and lifting those pesky limits. I also feel it’s fair to say that partitioning in BigQuery can be a little confusing for new users to navigate given its history and multiple implementations. But, hopefully by reading this post it will be somewhat clearer to you. Either that, or I’ve done the opposite and made it even more confusing. I’m sorry if that’s true. I truly am. One of the nice things about using the existing partitioning scheme is that you could specify on a query that you wanted to replace an entire partition using the dataset.tablename$YYYYMMDD table targetting mechanism. Is this still possible with field-based partitioning? So for example there was a problem in the system on 2018-04-01 and I need to regenerate all of the data for that date. Using field-based partitioning do I have to issue a DELETE followed by INSERTS or can i replace the entire partition atomically like I can with the older partitions? Can we bypass a partition limit by loading 2000 partitions wort of data in one single operation and then the rest 500 in the second operation? Is there a way to partition a Bigquery table using multiple columns?